The Maryland basketball team has cruised through the first nine games of Big Ten play with an 8-1 record. They’ve been tested quite a few times, but Purdue could offer the biggest one so far on Saturday. The Boilermakers are currently in third place in the Big Ten with a 7-3 mark in conference. They’re coming off a dominant 80-59 victory over No. 25 Northwestern on Wednesday. Purdue is a group that does an abundance of things extraordinarily well. This is a team that leads the Big Ten in assists (19.6) and three-point field goal percentage (42.4). The Boilermakers also are second in the conference in scoring offense (82.6 points) and field goal percentage (49.1). Four of their five starters average double figures on the season. One of Purdue’s biggest assets is their strength on the interior. 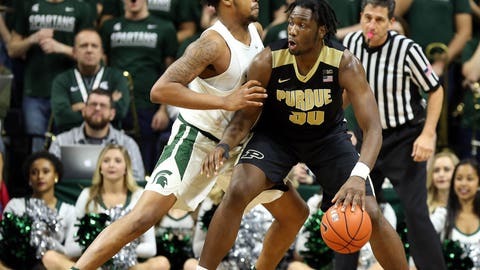 There’s few teams in the country that have a big man that rivals that of Caleb Swanigan. Swanigan averages a double-double (18.8 points & 12.9 rebounds) while also shooting 55.2 percent from the field. He’s recorded a double-double in each of Purdue’s last five games and is coming off a 24-point, 16-rebound effort against Northwestern. The Fort Wayne native is one of the more versatile big men that you’re going to find. Like most frontcourt players, Swanigan has a wide array of post moves and can score in a variety of ways. He also excels at passing out of the post as he averages 2.9 assists-per-game. Swanigan also shoots better than most big men. The former five-star recruit is connecting on 50 percent of his shots from beyond the arc. He’s made 24 of his 48 attempts on the season. As if Swanigan wasn’t enough of a workhorse down low, center Issac Haas also is capable of doing plenty of damage for the Boilermakers. Haas comes off the bench for Purdue, but still averages 13.3 points and 5.1 rebounds per contest. The Hokes Bluff, Ala. native is also shooting a team-high 60.8 percent from the field. The junior center isn’t the most athletic big man, but he sure does eat up a lot of space in the paint. Haas doesn’t step outside the low post often, but he really doesn’t need to with his size and skillset. He has a host of post moves that allow him put the ball in the basket. He thrives at spinning away from contact and slamming the ball home or going to his patented hook shot. His 7’2, 290-pound frame often gives Haas the advantage when he’s matched up in the low post. There’s very few players in the Big Ten that can contend with his towering size. Maryland big men Damonte Dodd and Michal Cekovsky are certainly going to have their hands full on Saturday afternoon. Both gives up 40 pounds to Haas, but they’re a little more similar in size to Swanigan. Swanigan only stands 6’9, which gives Maryland an advantage because Dodd is 6’11 and Cekovsky is 7’1. The Terps are definitely going to need more minutes from Cekovsky than he’s been used to playing since returning. The Slovakian native hasn’t played more than six minutes in his three games back. If he can’t log double-digit minutes, a lot of the defensive responsibility will fall on Dodd and Ivan Bender. The matchup down low could decide the outcome of this game. With the amount of star power that Purdue has, Maryland is truly getting their toughest test of the season.